It was a year ago almost to the day that my wife declared the fish and chips served by Nosh as the best ever she’s had in the States. When I sampled the fish, I couldn’t have agreed more. The thing is, Nosh is a food truck and the venue was the Crossroads Food Truck Snackdown. Since then, accolades have been piling up for Nosh, including an endorsement by the Seattle Times as the best chippy in town. Similar praise came from other publications. Today, we happened to be in the Westlake Center area in downtown Seattle when we saw Nosh among a few other trucks in the plaza outside. 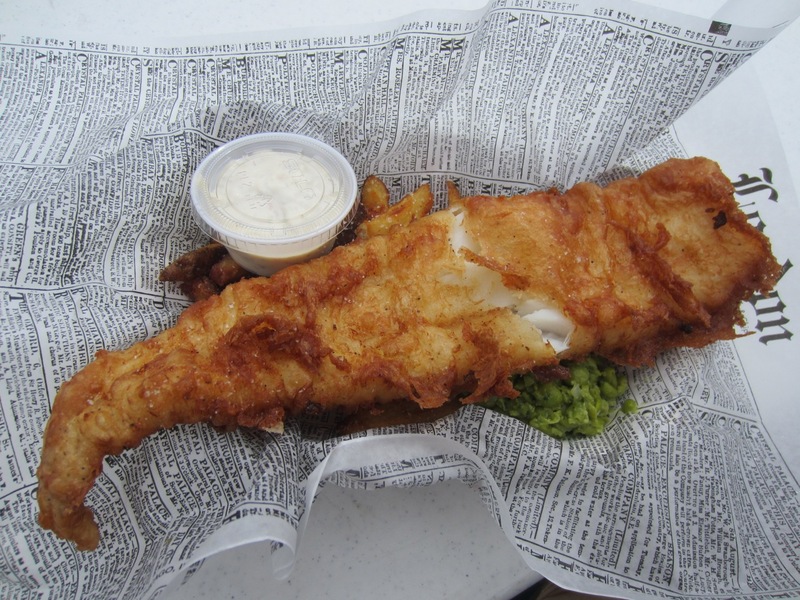 The fish and chips is made in the British-style, which as far as I can gather means mild white fish coated in a light, thin batter made from flour, beer, water and seasonings and served in a newspaper cone over thick-cut fries. Nosh’s batter, made with a local microbrew’s pilsner, is very thin and crispy, sprinkled lightly with sea salt, a far cry from the thick and oily batters that are more common these days. The star though is the almost foot-long Pacific cod that flakes apart so easily and is so moist that it seems caught only hours before. Couple the fish with an excellent tartar sauce and perfectly cooked, thick-cut fries that likely have been double-fried. A side of very good minted peas is also included. The fish and chips (☆☆☆☆) are decidedly superior to what I’ve had at any other restaurant, stand or truck, including Ivar’s, Spuds, Wally’s and Nordstrom Cafe. The only thing faux about the entrée is the ‘newspaper’ in which it’s served, a clever reproduction on parchment paper. Nosh has Seattle’s best fish and chips—bar none. (Update: 6-13-16) With fish and chips so good, it would be easy not to order anything else. 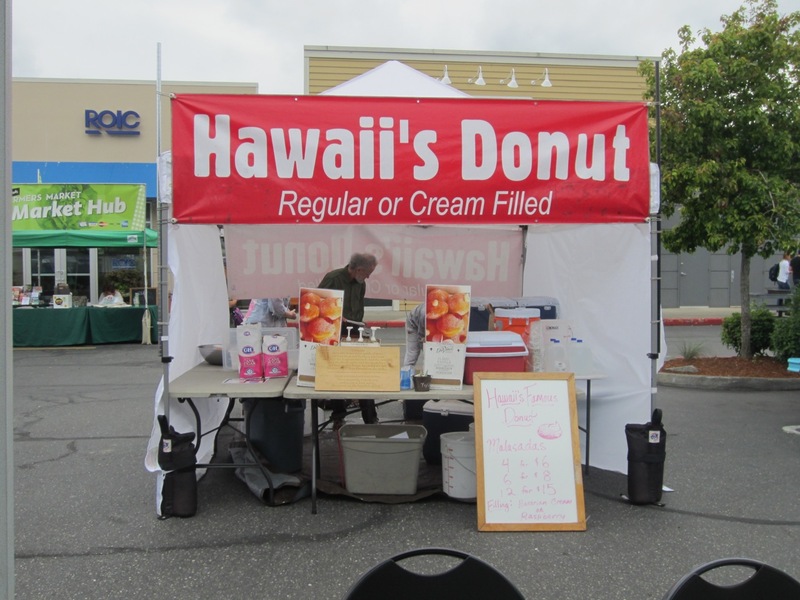 Nosh shows up in Bellevue every Monday at the downtown Barnes & Noble parking lot. (Validated parking for 1 hour.) At the noon hour, every truck in the pod was busy with customers, some who drove here, most who walked over from their nearby workplace. Even when Nosh’s line is ten deep, it doesn’t take long to get your food. Obviously, the two-person crew inside has the process down pretty well. Today, I decided to give another entrée a try—meatloaf sandwich. I’ll say this, if it weren’t for the fish, this sandwich could easily bring Nosh accolades on its own. I have yet to try Seattle fried rabbit and roasted bone marrow, Nosh’s other unusual menu items. The meatloaf is a tasty combination of pork and beef. The patty is somewhat soft, which I would have preferred to have a little more toothy substance. But it’s paired with sweet roasted tomatoes, caramelized onions, arugula, dressed with aioli and served on a toasted potato roll. What great flavors! The side of braised red cabbage is quite good, too. This is an a very good sandwich (☆☆☆½). 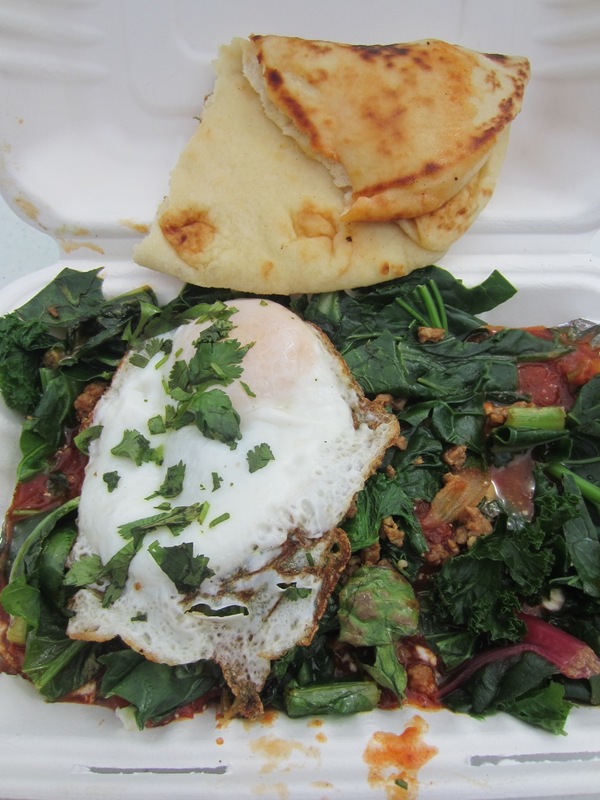 Gobble Express started showing up at the Issaquah Famers Market this year, swapping the sole food truck location every other week with Maximus/Minimus. As the name suggests, Gobble Express specializes in turkey, as does the brick-and-mortar operation, called Gobble Restaurant, in Woodinville. The truck has a more limited menu, including smoked turkey legs. The first time I ever ate one was at Disneyland two years ago, a transplant from Disney World where it has been a huge hit. My gnawing on it must’ve seemed like a Neanderthal moment to my family. In truth, I wasn’t so impressed, the leg meat being extremely chewy and stringy. So it was with a little trepidation that I took my first bite of Gobble Express’ drumstick. Not to worry, it was phenomenal, the meat succulent and smoky and burnished to a rich, dark brown. Gobble’s motto is You buy, we’ll fly, referring to its flexible catering business. Its drollery and terse rhyme remind me of another local smokehouse, Caveman Kitchen in Kent, whose motto is You choke ’em, we smoke ’em, referring to its side business of smoking any meat you bring them. The similarity doesn’t end there because the skin of the turkey leg is like that of Caveman’s vaunted chicken, very smoky, leathery—and delicious. Gobble Express also sells sandwiches made with BBQ beef brisket, pulled pork and pulled turkey, but the turkey leg is its best seller (☆☆☆☆). The latest Food Truck Snackdown at the Crossroads Shopping Center happened today, so we were sure to see what was cookin’. Two things were on the radar for this trip. It’s been several years that I’ve passed by the stand that sells Italian sandwiches at the Issaquah Farmers Market. I’ve tried most of the other food vendors’ fare, and none of them has left a lasting impression. That was about to change. WiseGuy Italian Street Food serves two hot hero sandwiches: sausage and pepper and Italian meatball. There are big pans of each filling cooking over stoves that attract passersby. Though WiseGuy at the market operates under a canopy, it normally is a food truck operation that roams the east side of Lake Washington. How better to sandwich both fillings than using Le Panier‘s baguette, a wonderfully light bread with a thin, crackly crust. It could almost be suitable for banh mi. (Le Panier’s pastries and sandwiches, served at Pike Place Market, are fantastic in their own right.) Each sandwich uses one-third of a loaf. 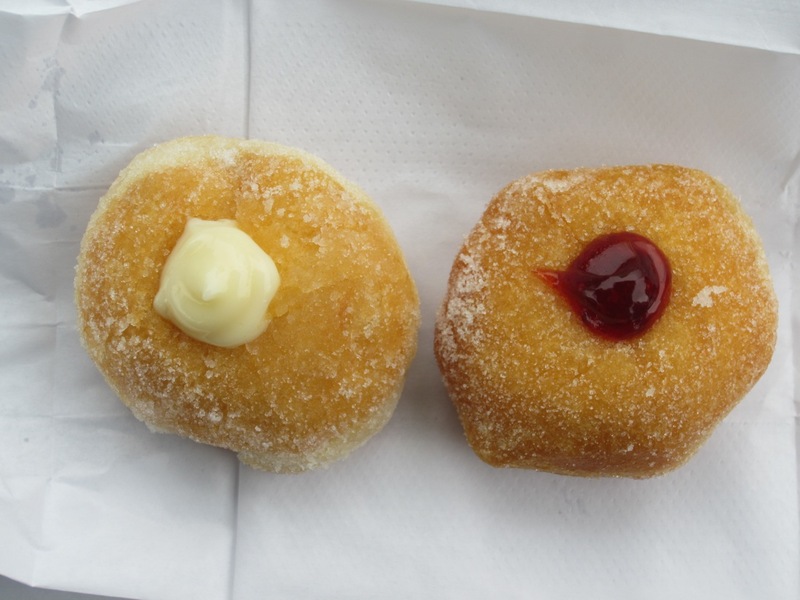 We enjoyed these last week, enough so that we made it a point to go back to the market today and try some variations. To address the slipping meatball problem, my wife got the option wherein—you guessed it—the meatballs are instead stuffed into an excavated loaf. So as not to skimp on the sauce, the server drizzles a spoonful of marinara in between each ball. Sure enough, no more slippage. But even so, part of the ecstatic pleasure of eating a meatball sandwich is the marinara itself, lots of it, which clearly a stuffed sandwich severely restricts. You trade convenience for sloppiness. In yet a third variation, you can get the traditional sliced bread with meatballs cut in half. For my money, the best soft tacos in Bellevue are served at El Maestro del Taco. La Cocina del Puerco served terrific ones too but the restaurant closed a few years ago. Cocina was a sit-down restaurant, while Maestro is a food truck that also sells tortas, cemitas, sopes, quesadillas and a carne asada plate (with rice and beans). It also sells burritos that can be ordered with any meat offered in a soft taco (lengua, cabeza, beef cheeks, adobada, asada and carnitas). My favorite taco filling there is asada, which is the reason I got a burrito filled with the same thing. I can say unequivocally that El Maestro del Taco’s burrito is in a league by itself. Let’s start with the flour tortilla wrap. Unlike at most places where the ends of a gigantic tortilla are tucked in before the burrito is rolled, a single turn of an 8-inch one barely covers Maestro’s substantial filling, potentially a big mess if the filling pushed out at one end when the other is bitten into. Fortunately, the whole thing is swaddled in foil. The absence of the tucks eliminates excessive tortilla that can double, even triple upon itself otherwise. A small matter maybe, but one appreciated by me. Plus, the tortilla itself is thin yet stretchy enough not to tear, putting all the emphasis on the filling. It starts with shredded iceberg lettuce for a pleasant crunch and generous slices of avocado for creaminess. Sliced pickled jalapeños add spiciness and zing. Rather than whole beans, Maestro uses savory refried beans that act as a glue to hold the rice together. The supremely flavorful asada is chopped and in generous quantity that there’s no mistaking it as the main ingredient, unlike other places (such as Casa D Taqueria) where the filling is mostly rice and beans, tasty as they may be. Also excellent is the tomatillo salsa that comes with the burrito. At $5, this classic burrito (☆☆☆☆), like everything else here, is a bargain.